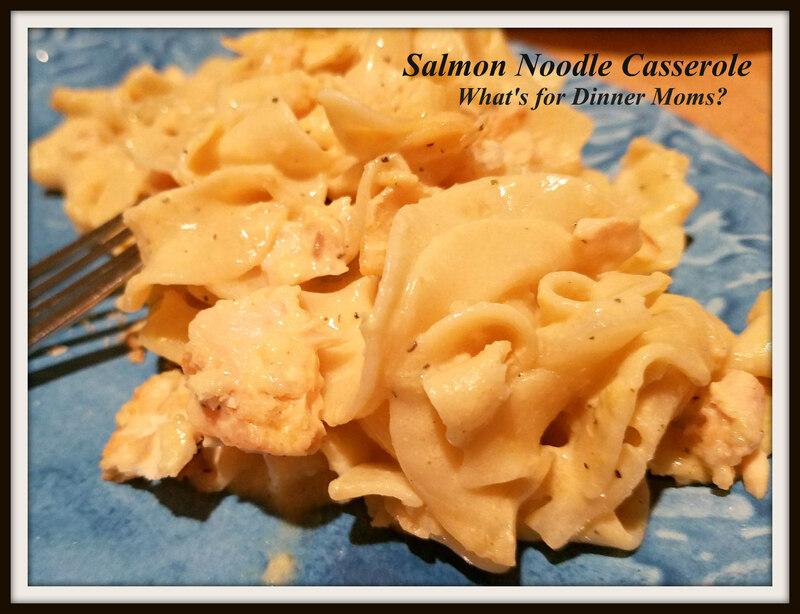 Salmon Noodle Casserole (The Un-Tuna Casserole) – What's for Dinner Moms? Each day feels a bit closer to real Spring weather. Soon the snow fence on the beach will be down and we will once again be heading to the beach in the evenings to watch the sunset or grab an evening swim. It is a chilly 35 degrees as I write this but I know it is coming. Until then we have casseroles and stews to keep warm inside as we dream of the sandy beach days ahead. As I have said in the past, we all have one food we do not have to eat. My partner’s is Tuna Noodle Casserole. My kids and I happen to like Tuna Noodle Casserole so when they were little I would make it for lunches occasionally so she didn’t have to eat it and the kid’s wouldn’t see her have something different from the rest of us. I think it is the thought of warm tuna. I love tuna melts too but I know that many others feel that warm tuna is yucky. So, the other night we had a pound of salmon to use. I really wanted Tuna Noodle Casserole but decided instead to make it into Salmon Noodle Casserole. I am in the middle of an experiment. I tried it with the traditional canned soups the other night and in the next few weeks I will make it with a homemade cream sauce to see how the dish fares. Although everyone thought I had lost my mind they liked this dish far better than they thought they would. The salmon added a different flavor and the Morton Nature’s Seasoning Blend added a different flavor to the dish. The best way to make this dish is the night before you plan on making it while you are making dinner or cleaning up cook the salmon with Morton Seasoning Salt over it according to package directions. Once it has cooled place in the refrigerator to use the next night for dinner. You can cook the salmon the night you make the casserole but for me it is easier to do it the night before. Preheat oven to 400 degrees. Spray a 9×9 baking dish with non-stick spray. In a large bowl mix cream of celery soup, milk, cheddar cheese, and Morton Seasoning salt until well blended. Once noodles are cooked and drained add them to the soup mix and stir until well coated. Add salmon, broken into small chunks, to the noodles and stir well. Pour mixture into prepared pan. Sprinkle with crushed crackers and bake for 20 -25 minutes until top is browned and center is heated through. Next Post On the Road Again…. Thank you! I hope you like it if you try it. I am going to make it again in a week or so with homemade cream sauce rather than the canned soups to compare.